Til Ke Ladoo: Laddoo is the Indian word for any ball-shaped sweet. Til ke ladoo is made from white sesame seeds (til) and jaggery (unrefined cane sugar). 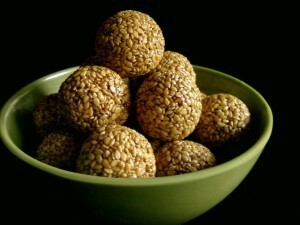 Til ka ladoo is a traditional winter sweet and made during the festival of Makar Sankranti. Dry roast the white sesame seeds on medium heat stirring continuously. Take the seeds out in a bowl. Set aside to cool sown to the room temperature. In the same frying pan heat the water and add the jaggery pieces. Simmer over medium heat till it starts caramelizing and forms a ball when you add a drop of syrup in cold water (2 string consistency). Add in the ghee, green cardamom powder and roasted sesame seeds. Mix thoroughly with jaggery syrup. Grease a plate and set aside. Transfer the mixture to the greased plate. Make all the ladoos while mix is still warm. Til ke ladoo are ready to be served. Serve til ke ladoo at room temperature. Til ke ladoo can be stored, in air tight container, for months.